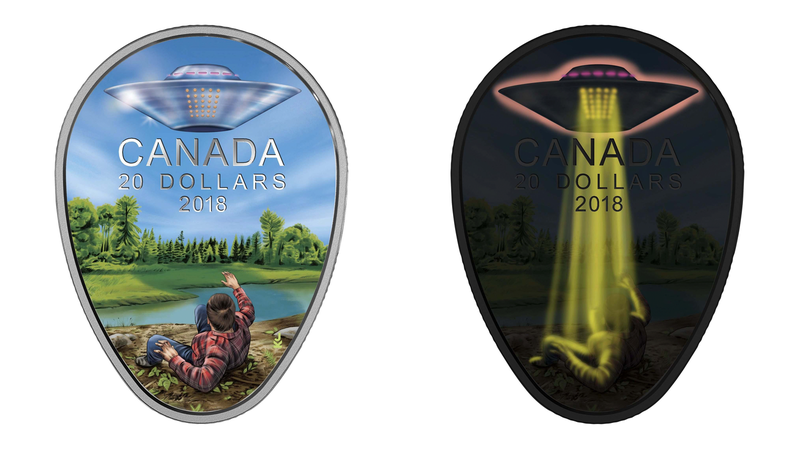 The Royal Canadian Mint has created a flashy, egg-shaped, glow-in-the-dark coin to commemorate one of Canada’s most famous UFO sightings. One side shows Queen Elizabeth II, as all Canada coins do, but the other side depicts Stefan Michalak lying on the ground as a flying saucer hovers above Falcon Lake in Manitoba, Canada. Michalak reported seeing two flying saucers near the lake on May 19th, 1967. He said that one landed about 150 feet away from him. He reported approaching the craft, getting close enough to touch it when it lifted off and knocked him on the ground. In the following weeks, Michalak said he became ill, suffering nausea, weight loss, diarrhea, and blackouts. About eight months later, a photograph of burn marks, in a pattern of dots, on his chest was taken. Stefan died in 1999, but Stan told the Winnipeg Free Press that “if my dad was still around, he would be floored” by the coin. The $20 silver coin released today retails for $129.95 CAD ($101 USD). Sure, that’s a lot of money to spend on something that’s supposed to be worth $20. But it also comes with a black light flashlight. When the proud owners shine the light on the coin, it shows the UFO beaming down light on Michalak, blasting him with the rays that allegedly left him sick and smelly.